Violence flares in Afghanistan amid reports that Taliban commanders met with U.N. officials. Violence flares amid reports that Taliban commanders met with U.N.
Kabul, Afghanistan (CNN) -- As talk emerged about a secret meeting of U.N. and Taliban officials, the battlefield lit up in Afghanistan, with a joint Afghan-international force and Afghan soldiers exchanging fire when both sides mistook the other for enemy combatants. The violence flared as a widely circulated news report said that senior Taliban commanders met in Dubai earlier this month with Kai Eide, the U.N. special representative for Afghanistan. The meeting reportedly dealt with the prospect of peace talks with the Afghan government. The United Nations won't comment on the reports, and the Taliban issued a flat denial of what it called "futile and baseless rumors." But they surfaced on the heels of this week's London Conference on Afghanistan, where President Hamid Karzai pushed a reconciliation plan to attract "disenchanted brothers" into law-abiding society, a reference to Taliban foot soldiers who fight to earn wages. Such breakthrough diplomacy would be welcomed by many Afghans weary and caught in the middle of the daily fight between Taliban and al Qaeda militants and Afghan security forces, backed by NATO's International Security Assistance Force. ISAF said small arms fire targeted a joint Afghan-international security force conducting an operation in Sayed Abad district of Wardak province that apparently originated from an Afghan National Army combat outpost. ISAF said the "subsequent air support called by the joint force likely killed at least four ANA soldiers." Wardak is near Kabul in the eastern part of the country. "We work extremely hard to coordinate and synchronize our operations. This is a regrettable incident and our thoughts go out to the families of those killed and wounded," said Brig Gen. Eric Tremblay, ISAF spokesman. The Afghan Defense Ministry said the clash occurred in the Akakhil village of Maydan in Wardak province, pointing out that it was a "joint operation of international forces" conducting a mission in an area where Afghan forces had been stationed. Both sides thought the other was the enemy, the ministry said. The airstrike killed four Afghan soldiers and wounded several others, the ministry said. Shahidullah Shahid, the Wardak governor's office spokesman, didn't mention the airstrike. He said four Afghan soldiers died and seven were wounded in what he said was an exchange of fire in the province's Sayed Abad district. The incident infuriated the Afghans, with the ministry saying "the people responsible for this incident will certainly be punished according to military law." In another part of Afghanistan, Ghazni province in the eastern region, two Afghan civilians died when NATO-led forces fired on a vehicle barreling toward troops, ISAF reported on Saturday. The vehicle moving at a high speed "failed to heed several warning signs to stop" on Friday and troops firing at the engine block killed the two Afghans and injured one more. A fourth person in the car was not injured. The incident, which occurred in the province's district, represents one of the trends bedeviling the international fight against the Taliban -- civilian deaths in the course of the war that have strained relations between Afghanistan and the United States and its allies. The numbers of civilian casualties have fallen off in recent months, since Gen. Stanley McChrystal took over as U.S. commander in Afghanistan. But escalation-of-force incidents at checkpoints, air bombings and accidents that have led to civilian deaths have undermined international and Afghan efforts to win wider civilian support. Earlier this week, a NATO convoy fired "on what appeared to be a threatening vehicle" and killed an imam, prompting angry demonstrations and an ISAF statement conveying regrets about the incident, which took place outside a U.S. military base on the outskirts of Kabul." "Despite all the measures that we put in place to ensure the safety of the Afghan people, regrettable incidents such as this one can occur," Tremblay said about the Thursday shooting of the imam. "On behalf of ISAF, I express my sincere regrets for this loss of life and convey my deepest condolences to his family." 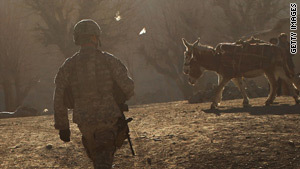 International troops continue to endure violence, and the latest occurred on Friday in Wardak province. A NATO official who asked not to be identified said two U.S. service members were killed by an Afghan interpreter, who was then killed. Initial inquiries by authorities have determined that the interpreter was disgruntled for work reasons and not a Taliban infiltrator. As for the London Conference on Thursday, a central focus was a $500 million pay-for-peace proposal to bring Taliban fighters into the civilian fold if they promise to renounce violence. The money would create jobs and housing in an effort to moderate the Taliban fighters, helping them return to civilian life. Major international donors are expected to pledge money for the effort. Karzai also said he would establish a national council for peace reconciliation and integration, followed by a "peace jirga" -- a traditional gathering of Afghan tribal leaders -- and said he hoped Saudi Arabia's King Abdullah would play a "prominent role." Karzai has suggested that high-level Taliban commanders could take part in the Afghan government in the future. This week, the United Nations removed several members of the Taliban from a blacklist, suggesting negotiations could take place in the not-too-distant future.